The Israeli company Elbit has been commissioned by the European Union to monitor the Mediterranean Sea. The company, which specializes in defence and surveillance technology, announced this at the beginning of November. For two years unarmed drones of the type „Hermes 900“ are to be launched from Portugal for reconnaissance missions. The flights will probably take place in the western Mediterranean around the Strait of Gibraltar. Responsible is the European Maritime Safety Agency (EMSA), which announced such plans two years ago. Last summer, EMSA tested two different drones in a pilot project. With their long endurance, they also belonged to the so-called MALE class, but are considerably smaller than the „Hermes 900“. Elbit advertises the latest model of the „Hermes 900“ as particularly suitable for „homeland security and border security“. Thus, the collapse of the Islamic state and „diverse geopolitical tensions“ have led governments to „re-orient defense efforts from involvement in far-away conflicts to coping with intensifying homeland and border security challenges“. According to the manufacturer, the „Hermes 900“ complies with European civil airspace regulations. This would mean that drones would also be allowed to take off from civil airfields and would not have to rely on specially established airspaces closed to civil aircraft. It is still unclear whether the contract with EMSA will be concluded for one or two years. The two-year option would cost the European Commission EUR 59 million. The main contractor is the Portuguese company CEiiA. The leasing contract also includes a ground station. The drone can be equipped with different payloads. Reports say, it flew armed operations in Gaza in 2014, even before its final certification by the Israeli military. For EMSA, the „Hermes 900“ will be delivered in a maritime version. According to the manufacturer, it carries a radar specialised in maritime surveillance, electro-optical cameras and a receiver for ship detection systems. EMSA wants to use drone flights to detect suspicious activities. For example, the agency monitors the pollution of the oceans caused by the release of hazardous substances. Traces of oil, for example, can be easily detected from the air by the drones. However, the Frontex border agency also receives pictures of the Elbit drones in order to prevent unwanted migration to the European Union. The background to this is a cooperation agreement between EMSA and Frontex, in which the fisheries agency EFCA is also involved. Together, the three EU institutions form the new Border and Coast Guard Agency (EBCG). 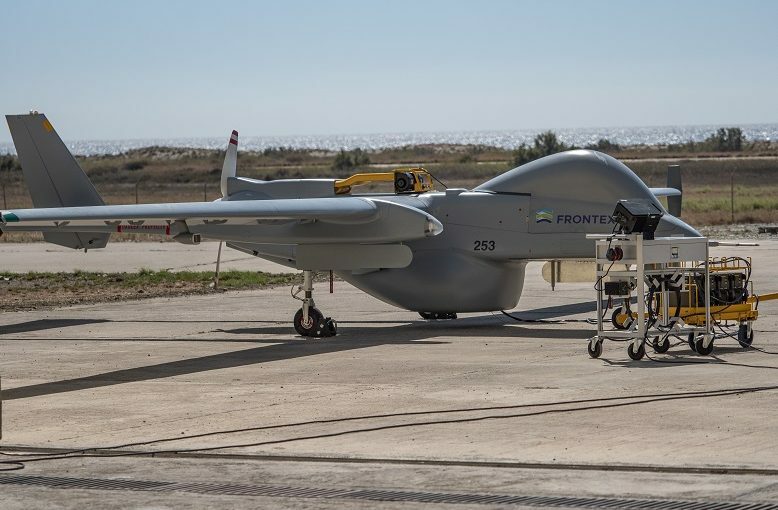 Frontex also flies with two unmanned aircraft in the Mediterranean. The larger model is an Israeli „Heron 1“ built by Israel Aeronautics Industries (IAI). The contractor for the pilot project, for which the Commission is spending almost five million euros, is Airbus, which is also providing „Heron 1“ for the German armed forces in Mali and Afghanistan. The European armament group also flies the drones itself, for example for maintenance or after repairs. The Frontex drone will initially fly 600 hours from Crete, and the contract could then be extended if necessary. Operations will mainly take place in the Aegean Sea. In addition to IAI, the Italian company Leonardo has also been awarded the contract to use a Falco drone. It has a payload of around 100 kg. The contract is worth 1.7 million euros and the drone flies from Sicily. According to IAI, the „Heron 1“, which carries a large sticker from Frontex, reached the 200-hour mark at the end of October. The average flight time was 14 hours. Like its competitor Elbit’s model, the „Heron 1“ is equipped with electro-optical sensors that allow the Mediterranean to be observed independently of daylight. A maritime radar and a system for receiving ship position data (AIS) are also on board. If the drone is within sight, it is controlled via terrestrial radio. Outside the range of vision („Beyond Line of Sight“), the control system switches to satellite communication. The surveillance videos can be transmitted to several users simultaneously in real time. Frontex also tested a similar system last year. After all, long-range drones from the US manufacturer General Atomics also fly missions in the Mediterranean. The company became known for its „Predator“, with which the US military and the CIA since the 1990s have been carrying out attacks and extrajudicial killings in countries such as Pakistan, Afghanistan and Yemen. The successor model of the drone is the „Reaper“. Outside the USA, the General Atomics drones currently only fly in the armed version in Great Britain, but many other countries use the „Predator“ for surveillance from the air. The Italian military has stationed several „Predators“ in Sicily. They were used in the framework of the military mission EUNAVFOR MED, with which the European Union monitors the central Mediterranean. The objective of the military mission is the pursuit of „human smuggling“. However, EUNAVFOR MED is only successful with the further mission objective of training the Libyan coastguard to intercept refugee boats. According to the official version, the Italian military drones should clarify whether the members of the coastguard apply what they have learned correctly. Until May, the „Predators“ were in action for 240 hours. Should EUNAVFOR MED be extended by a further year in December, the drone flights could become regular operations. Image: IAI’s Maritime Heron at Frontex’ service.